We typically go for classic burgers around here – beef patties with American cheese and ketchup – so this recipe was a quite a bit outside of our norm. I’m really glad we went outside our comfort zone with these because we both really, really loved them. 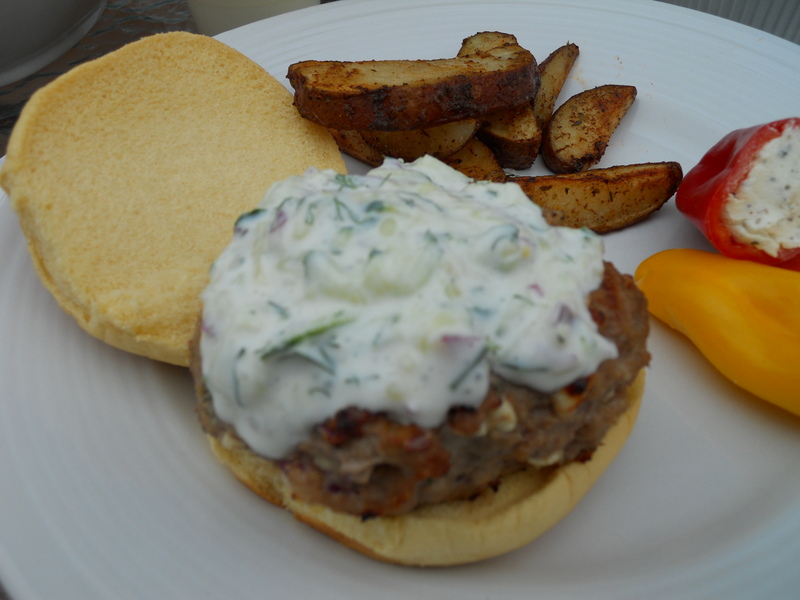 The burgers were nice and juicy and the Tzatziki Sauce topping gave them a really light, fresh taste. These are super quick to make, which makes them a great weeknight dinner for the summer months – they’ll definitely be a regular around here! In small bowl, mix 1/2 cup yogurt and remaining sauce ingredients; refrigerate until serving. In medium bowl, mix all burger ingredients and remaining yogurt. Shape mixture into 4 patties, about 1/2 inch thick. Place patties on grill over medium heat. Cover grill; cook 8 to 10 minutes, turning after 5 minutes, until thermometer inserted in center of patties reads 160F degrees. Tried the tzatziki sauce. It was fabulous! ! I suggest you double the recipe, because you’ll want to find other dishes to use delicious sauce.We had them with the chicken gyros. Loved it! !